Nikola Kross has battled aliens and won. But her father, who was kidnapped by evil extraterrestrials, is still missing, and now it's up to Nikola and her friends to find and rescue him before it's too late. He could be anywhere in the known universe, and they have little to go on except a desperate secret communication--"Kindly rescue me at your earliest convenience"--and an unhelpful clue that he's in a secure facility somewhere deep underground. But the extraterrestrials are still determined to capture Nikola. And if she gets abducted, she won't have to wonder where her father is . . . because she'll already be there. In this funny and exciting sequel, Nikola and her friends discover new and unexpected allies and come face-to-face with a strange and mysterious enemy, one so powerful and so dangerous, they dare not speak his name. Eliot Sappingfield was last seen wearing a blue shirt and khaki pants in the vicinity of his home in Missouri. He is known to appreciate stories, science, and various other geeky things. He may or may not be accompanied by his wife, his two daughters (when they don't have anything better to do), or a pair of goofy basset hounds. He is considered unarmed and not terribly dangerous. 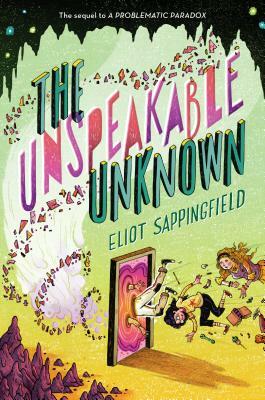 The Unspeakable Unknown is the sequel to his hilarious debut novel, A Problematic Paradox.